The prime minister of the Tibetan government-in-exile speaks about the future of the Tibetan cause. When the exiled spiritual leader of Tibet, the Dalai Lama, said recently that the tradition of the Dalai Lama should end with his death, a new debate began about the future of the Tibetan movement. At a time when the world is focused on containing violent struggle, can the peaceful, democratic Tibetan movement retain international attention? With China expanding its sphere of influence and creating a new geopolitical paradigm, the Tibetan movement is also losing some of the support it previously enjoyed. For instance, Pope Francis recently declined a meeting with the Dalai Lama, citing the “delicate situation” with China. Where does the Tibetan movement stand now? How relevant is in today? And what comes after the Dalai Lama? 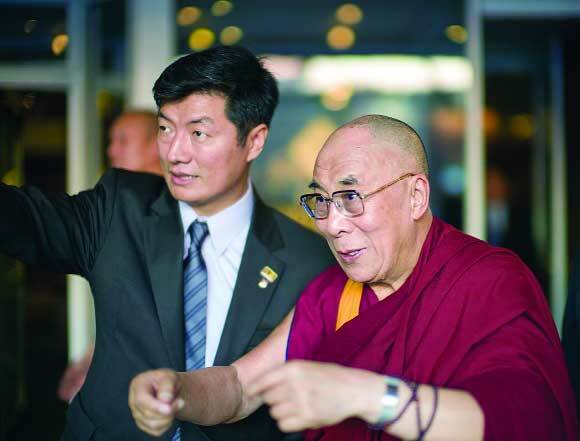 The Diplomat’s Sanjay Kumar put these questions to Lobsang Sangay, the prime minister of the Tibetan government in exile and the second most powerful Tibetan leader after the Dalai Lama. Sangay is a democratically elected leader who came into the limelight in 2011 when the Dalai Lama decided to abdicate political responsibility. From humble beginnings in a refugee camp in Darjeeling, he went on to study at Harvard Law School. The suave and erudite Sikyong, as the leader of the Tibetan government in exile is officially known, carries the burden of not only keeping the movement alive but also sustaining the passion for the Tibetan movement among a new generation of exiles. Where does the Tibet movement stand now? The movement is strong, mainly because the Tibetan people inside Tibet are strong. This is the third generation now since the occupation of Tibet but they are very strong in spirit. They are very strong in intellect, they are very strong in their determination and sense of solidarity. In the recent history of Tibet, Tibetans as a people have never been as united and in solidarity as they are now. In that sense the movement is strong. The younger generation is getting a better education, better skills, and better jobs, hence they are more capable. In that sense our movement is stronger. The Dalai Lama recently mentioned that the hardliners in China are not allowing Chinese President Xi Jinping to grant autonomy to Tibet. Is that how you look at it? What His Holiness is saying is that the hardliners in China continue to maintain hardline policies, but they have to realize that hardline policies on Tibet are not working. Because wherever there is repression there will be reaction and protest. Repressive policies are not working, that’s why we are here today talking about Tibet even now. If occupation and repression were the solution then the Tibet issue could have been solved a long time ago. But no, even after fifty years we are still talking about it. Hence repression is never a solution. Liberal policies are the solution. So the hardline leaders are wrong on this issue yet they continue to maintain that their policies might work and they think that depriving Tibetans of genuine autonomy could lead to a long-term solution, which is not likely to be the case. You started with a demand for a separate Tibet, then you started calling for autonomy. Have you diluted your stand, or is it a matter of bowing to political realities? The middle way policy, which is to seek a genuine autonomy within China, has actually been going on since the 1970s. It was formulated more clearly in the 1980s. Since 1987, the middle way policy has become a formal policy and since that time it has not been a dilution but is being realistic given China’s position historically and now, and given the position of the international community historically and now. Hence, this is a farsighted view, a win-win proposition for both the Chinese government and the Tibetan people. Why do you think China is resistant to calls for autonomy? You should look at Hong Kong, its one country-two systems. Look at Macau, they have a separate solution for that. Even if you look within China, like Shanghai – they have different policies and strategies and administrative mechanisms. But when it comes to Tibet you can still see a reluctance on the part of the Chinese government. [This is] partly because there is an underlying suspicion and partly because we are Tibetans not Han Chinese. With Han Chinese, the one country-two systems [model] was used for Hong Kong, Macau, the special economic zones, and Shanghai. With Tibetans, the underlying suspicion is much higher and much deeper from the Han Chinese side. They have to overcome this suspicion and if they can find a different arrangement for different parts of China they should find a viable solution for the Tibetan issue as well. This deep distrust is historical and it is also strengthened by you leading a government in exile. Are they connected? Does India’s support for the Tibetan cause add to the distrust? Historically Tibetans and Chinese did not have such distrust. Because if you look at the Jokhang temple, the statue of the temple was brought from China. Chinese Princess Wen Cheng is also there. Jokhang is the most holiest shrine in the Tibetan world. So Tibetans still have great regard for the Chinese princes who brought the statue and the temple is still the most precious one. And for hundreds of years Tibetans and Chinese lived side by side. At one time or other we invaded them and sometimes they invaded us. Somehow we always found a way to work out an arrangement where both sides could have a win-win solution. For the last 50 years the occupation of Tibet has been a mistake on the part of the Chinese government. Never in its history has Tibet been occupied for so long and repressed for so long. On the part of the Chinese government it is a mistake. Now, as far as the central Tibetan administration is concerned, which is based in India, it is a byproduct of the occupation. If the occupation and repression had not taken place then the central administration of Tibet would not have been based in India. And we would not have been accepting support from the international community and from India as well. So the cause is the Chinese government and the occupation of Tibet. How do you see India’s role in the Tibetan movement? India has done the most for the Tibetan people. Large numbers of Tibetans are in India; the Tibetan administration is in India. So India has done the most for the Tibetans from a humanitarian point of view. Now as far as Tibet as a geopolitical issue is concerned, it should be one of the core issues for India as well, because geographically Tibet is more [closely] linked to India and South Asia. Spiritually, too, Tibet is more [closely] linked to India, Bhutan and Nepal, and environmentally also all the rivers and forests are linked more with India and South Asia than with China. So India has many reasons to see Tibet as one of its core issues. Is India doing enough for the Tibet movement? India is already doing too much. As a guest of incredible India we cannot demand much; the only thing we can do is to request that Tibet be regarded as core issue for India. What is India’s stand: Does it support autonomy or independence for Tibet? India has yet to formally say anything on this issue. India always says that His Holiness the Dalai Lama is an honored guest and then provides humanitarian assistance to the Tibetan people. India acknowledges Tibet in some form of an autonomous state – this is the status right now. How is the new political arrangement of having both a spiritual leader and a political leader working? The arrangement is a natural evolution according to the vision of His Holiness the Dalai Lama. The institution of the Dalai Lama for the last four hundred years entailed both political and spiritual leadership; now we are separating the two. In 2011, the Dalai Lama separated one from the other. Now he has devolved his political authority to the office of Sikyong, which is my position. So far the arrangement has been very good. Tibetans all over the world – inside and outside Tibet – are very keen and supportive of the transition. Recently, the Dalai Lama said that the institution of Dalai Lama should end with him. He was quoted as saying that it would be better that the institution of Dalai Lama goes rather than an incompetent person take over. I think he often says that. Logically, what he is saying is that it is better to have a popular Dalai Lama. People [are more likely to] remember the institution with a popular Dalai Lama than with some nondescript Dalai Lama. But the institution of the Dalai Lama has been very successful. If you read the history of all the Dalai Lamas almost all have been successful. Unfortunately, between the 8th and 12th the Dalai Lamas did not live long. Almost all the Dalai Lamas have left a strong legacy. So long as the Dalai Lama lives long the legacy will be good. Still, do you fear what comes after this Dalai Lama? Obviously no one can fill the shoes of the Dalai Lama. That is a given. He is a global statesman, a Nobel Laureate of international stature. But then this is about Tibet and the Tibetan people. Tibet as a nation at the roof of the world, the Tibet plateau will be there. The Tibetan people will be there to continue the struggle. It is certain that we will continue like any other conventional movement. The 15th Dalai Lama will be there. The younger generation is more talented, more skillful, more educated. We will be strong. Some analysts say that the Chinese government is waiting for the present Dalai Lama to disappear from the scene so that it can negotiate a final settlement with a pliant new Dalai Lama. That strategy is wrong because whenever you reach an agreement, it has to be delivered to the people. How you do that? With His Holiness the Dalai Lama whatever agreement you reach with him the absolute majority of Tibet should agree with that. Then we will follow the Dalai Lama’s direction and implementation would also be effective. Now if you are waiting for a scenario where actually you don’t have anyone to deal with then it would be more problematic. An agreement is not a piece of paper, an agreement has to be implemented. With non-democratic movements and violent struggles getting the world’s attention and a democratic movement like yours failing to create the same buzz as before, are you apprehensive that the world might forget the Tibetan cause? Does that trouble you as a leader? We will not let that happen. We are a non-violent movement. We feel justice and truth is on our side so we will raise the flag as high as possible and we will keep moving in that direction. At present, the world is more focused on violent movements, radicalism, and terrorism. That is not our fault. That is the problem of the priorities set by the international community. If you give more attention to violence and violent movement and scramble to decide how many tanks and how many guns to send then your priorities are wrong. There are so many marginalized groups in the world who are also watching whether to follow the Tibetan model, which is non-violent and peaceful, or other models. If the international community pays more attention to the other models then other marginalized groups might follow those models, which means more violence. Then you enter this vicious cycle of violence and support for violence. If you want to see a peaceful world it is better to support a non-violent movement to begin with. In that sense we are very proud to have a non-violent movement. This is the model the rest of the world should embrace and support. In India, the new generation is noticeably less passionate about separatist or insurgent movements. We see this happening with the Naga movement and other separatist movements. How passionate is the new generation of Tibetans about the cause? As far as Tibetans are concerned that does not seem to be a problem. I am also from a second generation of Tibetans. I was born and brought up in India in a small refugee camp, came to a refugee school, then went to Delhi university, then to Harvard Law School in the U.S. I have returned to serve the Tibetan cause. So have my other friends and colleagues. So our generation is as passionate as before. In fact the younger generation both inside and outside Tibet are more passionate. Some of the protests inside Tibet are led by middle school kids, college students. In exile also those who are in their 20s are providing leadership, so the passion is very much there. They realize that their civilization is at stake. Their identity, their dignity is at stake. They really want to continue the hard work of the earlier generation and fulfill the legacies of the elder generation. How do you react to the Pope’s refusal to meet with the Dalai Lama? It is really unfortunate that in this age when two great moral leaders of the world –models or examples for everyone – cannot meet because of pressure from the Chinese government. That is really sad and unfortunate. It is a commentary on the existing moral values of the world. I think every human being goes through difficult times. Every nation goes through a tragic phase, every community faces a challenging experience, but when there are challenges it is all the more important to firm up your moral values and stand up for moral values. With Chinese influence expanding and many countries less vocal in their support for the Tibetan movement, how do you think your movement will fare? Do you fear a loss of international support? No, we don’t. If you read any autobiography or biography of any great leader or the history of a really great nation or their struggle they all go through the same phase. When Gandhi led the freedom struggle no one thought that a man in simple clothing can do anything to the British Empire. It used to be said that the sun never goes set on the British Empire and one man could never do anything. But the narrative changed. Everyone wrote off Nelson Mandela. Aung San Suu Kyi was almost forgotten because people thought that she would spend her whole life under house arrest. People write you off. But as long as you remain truthful and stick to human values opportunities come to you. Justice and truth will always prevail. The Buddhist sense of impermanence always helps and the four noble truths are an inspiration. Every inch you get in your struggle is an addition.